My sister-in-law and brother-in-law both had the day off yesterday so we set out for a family fun day of brunch followed by the beach. 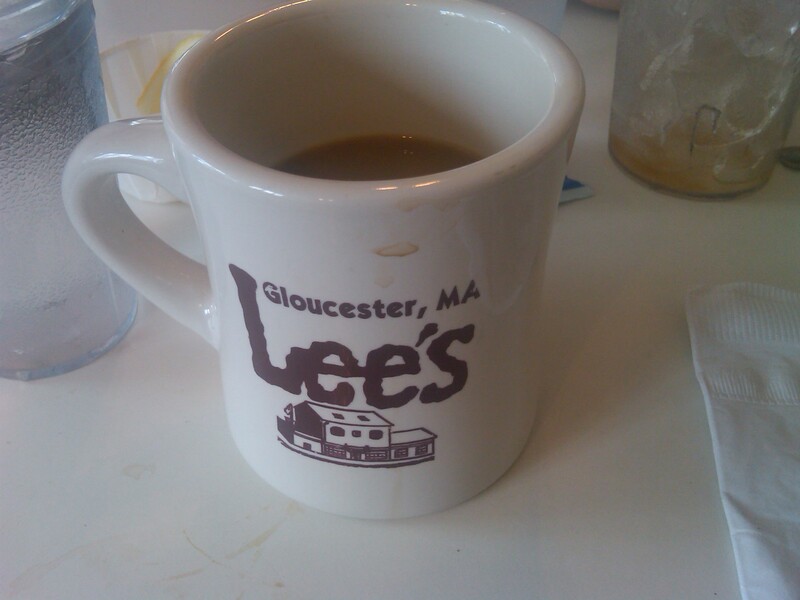 There are a number of tasty brunch spots in town, but we selected Lee’s, a blue-collar diner-esque place just across from the working harbor. There was a short wait for a table of six, so we sat outside and enjoyed the sunshine. We were finally called inside and the six of us stuffed ourselves into the booth. I immediately ordered a cup of coffee. 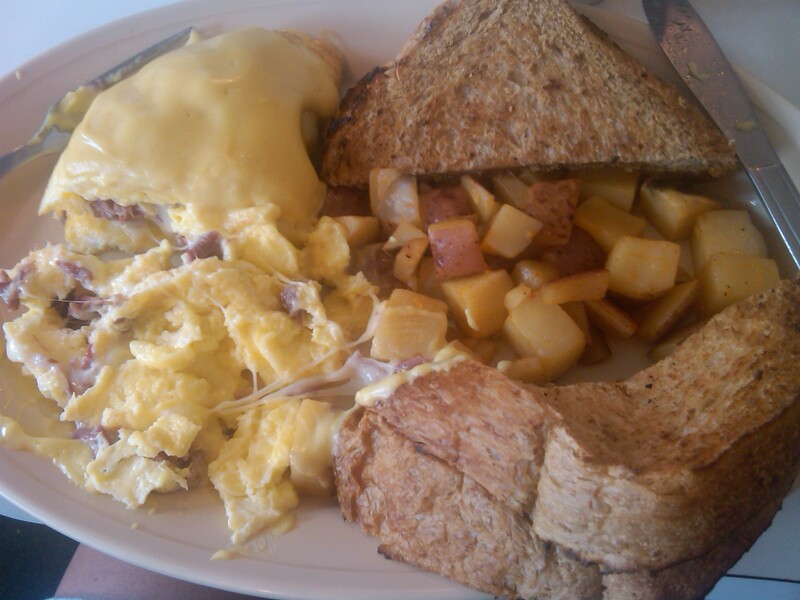 Lee’s has an extensive breakfast menu with a vast array of omelettes, scrambles, pancakes and more. My sister-in-law and had difficulty deciding, while my in-laws zeroed in on the “big breakfast” of 4 eggs, homefries, bacon, sausage, toast and a gigantic blueberry pancake. (EDIT: My mother-in-law wants me to clarify that they split the breakfast. She is not a trucker.) 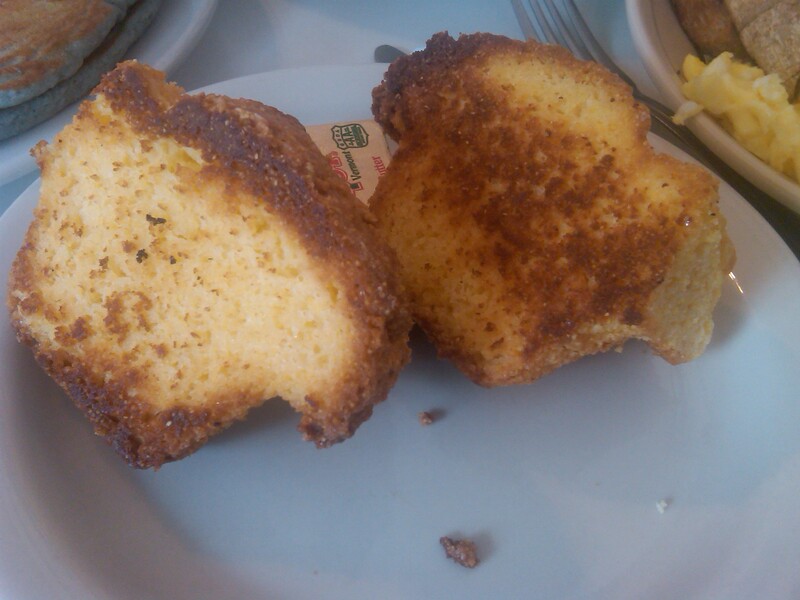 They got a grilled corn muffin on the side, which Lee’s is apparently known for. 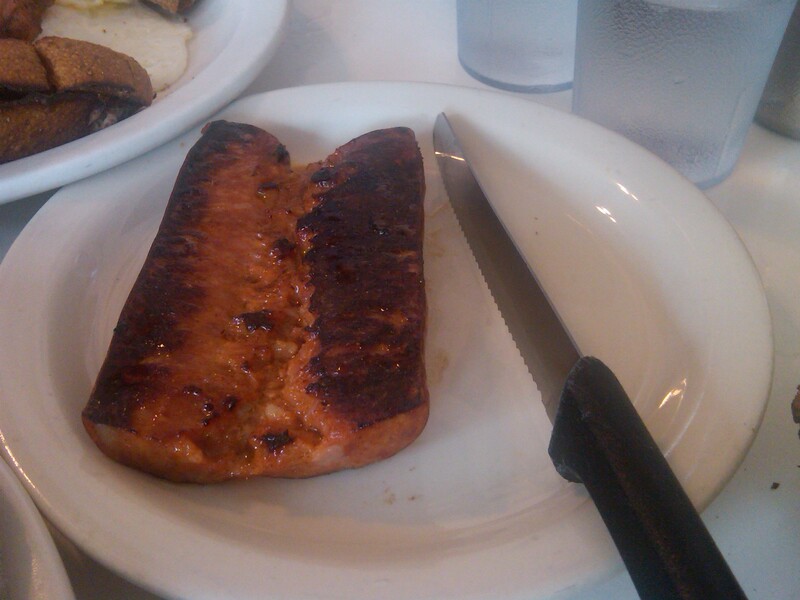 The muffin came to the table split and nicely charred. I had a small bite which filled my mouth with corny goodness. 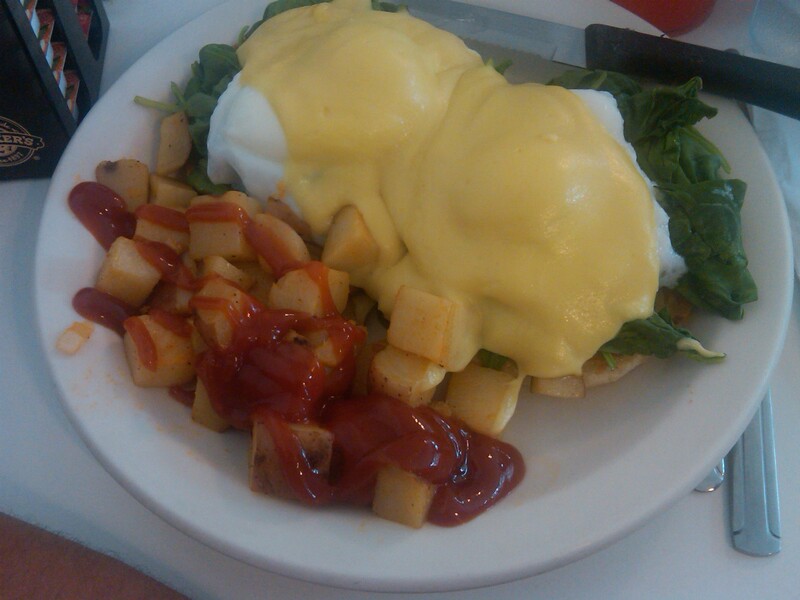 My husband, who has an affinity for hollondaise sauce, ordered the eggs florentine which came to the table with fresh spinach that slowly wilted under the hot eggs and sauce. I had difficulty deciding what to eat, but was prompted to hurry up by my very hungry father-in-law. I wavered between the “Julie” which was a southwestern-style scramble with cheddar, tomato, mushroom, pepper, onion and jalapeno and the “Irish omelet” which was an interesting combination of corned beef, swiss and hollandaise. I couldn’t decide if the latter would be a delicious gooey mess or an absolute disaster–so of course I decided to order it! I’m weird about my omelettes. I like the ingredients to be mixed so that I get a little bit of everything in each bite. I don’t like them to be too eggy–I like the filling better than the egg itself. The omelet arrived to the table and looked rather unassuming. Much to my delight, it was the perfect ratio of filling to egg–not too disgustingly overstuffed, yet I didn’t get any bites of egg and egg alone. The saltiness of the corned beef was balanced by the mild nuttiness of the swiss cheese and smooth creaminess of the hollandaise. I mean, come on. Hollandaise is so damn good, regardless of Anthony Bourdain’s warnings that it tends to be festering with bacteria. The house made wheat bread was a great addition to the meal, yet I barely put a dent into the al dente and under seasoned potatoes. Other items were a short stack of gigantic, plate-sized blueberry pancakes and the Portugese, chorizo-like linguica, which is a local favorite. 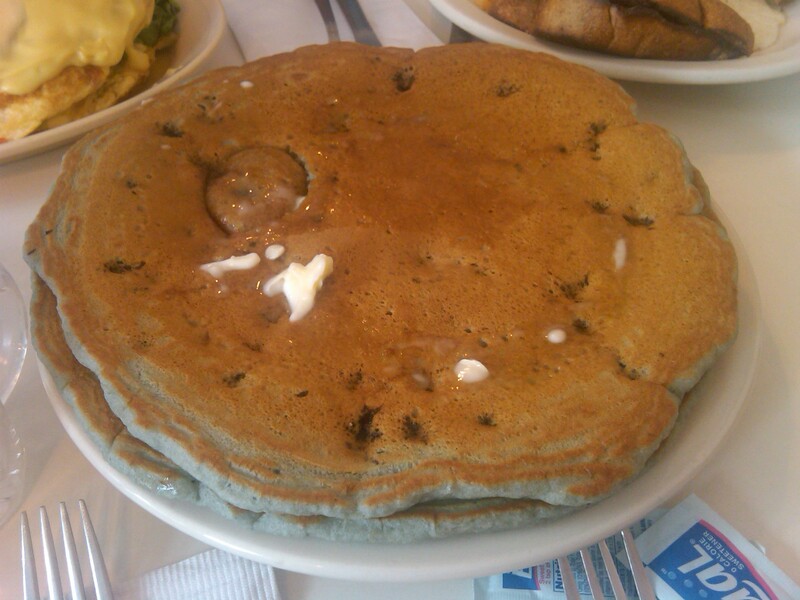 We were underwhelmed and missed the pop of blueberry in our mouths with each bite when it came to the pancakes. I don’t generally eat pork, but tried a tiny bite. My dining companions raved about the subtle spice and wanted to come back for more. 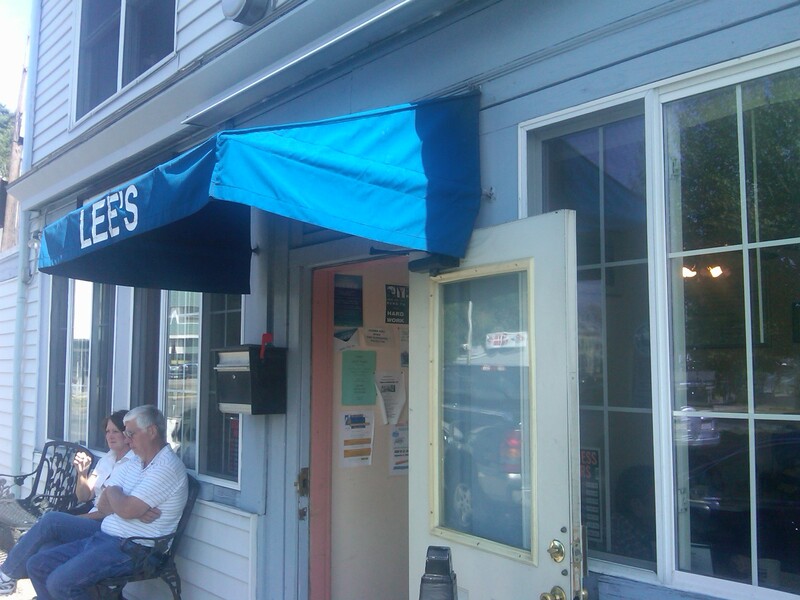 Lee’s was a great way to start a day of sunbathing, paddle ball and beach reading–and it was heavy enough to tide us over until our lobster dinner. Stay tuned!